Is the Hamilton® CapTel® App compatible with all iPad versions? Can I use my Hamilton CapTel account on my iPad and Smartphone? Can I add my extension to the “My Phone Number” box in the "Options" tab? Can I place calls using my existing iPad Contacts? I have a Hamilton CapTel Call Me #, can I use it on my iPad? I have a Hamilton CapTel Call Me # for my iPad. Why aren’t my calls coming through? I have a Hamilton CapTel Call Me # on my iPad. If I use Hamilton CapTel on a PC/Mac, where will my calls be directed? I have a Hamilton CapTel Call Me #, but I’m not logged in on my iPad. What happens when someone tries to call my Call Me #? How does Caller ID work with the Hamilton CapTel App? I’m experiencing difficulty connecting to Hamilton CapTel service. How do I know if there”s a service interruption occurring? The Hamilton CapTel App will work with iPad models running the latest publicly available version of iOS. You must have a telephone (i.e. landline, office, cell phone, smartphone) to talk and listen during your telephone conversation. For the captions to work on your iPad, you must be connected to a 3G/4G network or Wi-Fi. Yes, you can use your Hamilton CapTel account on your iPad and Smartphone. Using your iPad and any telephone (i.e. landline, office, cell phone, smartphone), you can place calls using the Hamilton CapTel App. Read captions of what’s said that appear on the iPad, while you listen and talk over your desired telephone. First, be sure to enter the number associated with the telephone you are using under the “Options” tab, which can be updated at any time in between calls. From the Hamilton CapTel App call screen, enter the number of the person you wish to call in the “Number to Dial” box. To select a number directly from your iPad’s contact list, simply click on “Contacts” at the bottom of the screen. Be sure that your headset is properly connected and ready to use. After placing the call, you will automatically be taken to the Captions screen where you will connect with the captioning service. Your phone, as pre-established in the “Options” tab will ring, notifying you that you have received a call from the Hamilton CapTel Call Center. Once you answer, the phone number of the person you wish to call will automatically dial. 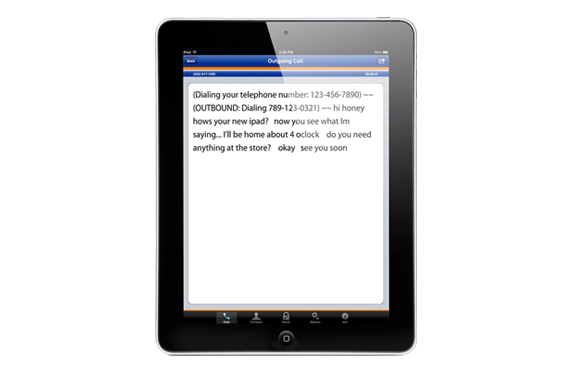 The Hamilton CapTel App allows you to view the captions of your call on your iPad. When the person you are calling answers, you can listen to what is being said while reading the captions on the screen. If your call is answered by a message system, the message will be captioned and you will be able to leave your message accordingly. You can end your call at anytime by hanging up or clicking the “End Call” button. Yes, you can select numbers to dial from your iPad Contacts through the Hamilton CapTel App. Simply touch the “Contacts” tab within the app and you’ll be able to see all of your contacts there. Select a name/number and your call will be placed! Yes. Receiving calls on the Hamilton CapTel App for iPad with your Hamilton CapTel Call Me # is easy. The Hamilton CapTel Call Me # is a ten-digit phone number that anyone can use to call you directly. Not sure you have a Call Me #? Simply go to the Hamilton CapTel App and open the “Options” tab. If the Hamilton Call Me # field has a ten-digit number, this is the number you can share with family, friends and businesses! If you do not see a number, you can open the Safari browser on your iPad, log into your Hamilton CapTel account and visit the “Receive Calls” section. After you’ve received your Hamilton CapTel Call Me #, all you have to do is open the app on your iPad and make sure that Receive Calls is set to ON. Yes you can! To find out if you already have a Call Me # associated with your iPad, visit the “Options” tab. If you see a ten-digit number in the “Hamilton CapTel Call Me #” field, you’ve already registered for a number. If you don’t see a ten-digit number here, simply log into your account at https://www.hamiltonwebcaptel.com/ and visit the “Receive Calls” page. If you log into Hamilton CapTel on a PC/Mac, your captioned calls will be directed to your PC/Mac and to the number that is entered in the “I’m at this number” field. Once you log out of your PC/Mac, your iPad will start receiving captioned calls again. At this time, it is not possible to change these features during a captioned call. It is recommended that you set your features prior to making and receiving calls. At this time, it is not possible to access the menu options during a call. It is recommended that you set your call preferences prior to making and receiving calls. Yes. When the call ends, click on “Save Call” located on the upper right corner of the Outgoing Call page. This will automatically save the most recent conversation. To view saved conversations, click on the “Saved” icon from the menu and select the saved call you wish to review. You can delete saved calls in the “Saved” menu. Click on “Edit” in the upper right corner and select the saved call(s) you wish to delete. Select “Delete” and then select “Done”. Voice and data plans may be accessed when using Hamilton® CapTel®. Hamilton CapTel is not responsible for charges incurred with your phone and/or wireless network for voice and data usage. For usage concerns, contact your wireless network directly. Note: older versions of the iPad may not be compatible with the Hamilton CapTel App.